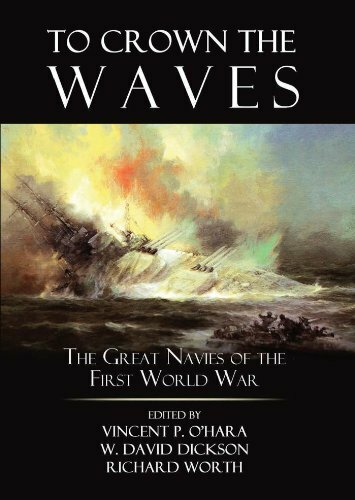 Vincent P. O'Hara and W. David Dickson, "To Crown the Waves: The Great Navies of the First World War"
The only comparative analysis available of the great navies of World War I, this work studies the Royal Navy of the United Kingdom, the German Kaiserliche Marine, the United States Navy, the French Marine Nationale, the Italian Regia Marina, the Austro-Hungarian Kaiserliche und Königliche Kriegsmarine, and the Imperial Russian Navy to demonstrate why the war was won, not in the trenches, but upon the waves. It explains why these seven fleets fought the way they did and why the war at sea did not develop as the admiralties and politicians of 1914 expected.&lt;b&gt;&lt;br&gt;After discussing each navy’s goals and circumstances and how their individual characteristics impacted the way they fought, the authors deliver a side-by-side analysis of the conflict’s fleets, with each chapter covering a single navy. Parallel chapter structures assure consistent coverage of each fleet—history, training, organisation, doctrine, materiel, and operations—and allow readers to easily compare information among the various navies. The book clearly demonstrates how the naval war was a collision of 19th century concepts with 20th century weapons that fostered unprecedented development within each navy and sparked the evolution of the submarine and aircraft carrier. The work is free from the national bias that infects so many other books on World War I navies. As they pioneer new ways of viewing the conflict, the authors provide insights and material that would otherwise require a massive library and mastery of multiple languages. Such a study has special relevance today as 20th-century navies struggle to adapt to 21st-century technologies.